We used a bipolar stepper motor to turn the disk of our smart desk. 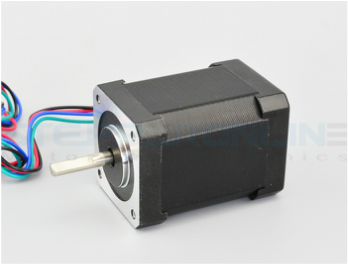 The model we used was nema 17 stepper motor, 17HS24-0644S. Since we used a low current, high torque stepper motor, we were able to use an arduino motor shield as the stepper motor driver. For the power supply we used 12V-5A power wall adapter. 4 IR sensors are used in this project. The IR sensors are attached under each of the hangers on the turning disc. Each IR sensor checks whether an item is hanging or not. In order to accurately use IR sensors to check if an item was taken, we used the difference of the current and previous IR distance values. The sensor checks the distance of an item every 0.3 seconds and then compares the value with the previous value. To make the sensors work properly, we calibrated the sensor and found the appropriate difference of the sensor value, which was around 40. We showed the weather forecast and other useful information using a display. We made the GUI of our weather forecast using the PyGame package of python.​ The display was connected with the raspberry pi using an HDMI cable. For the stepper motor driver, we used arduino motor shield. ​The motor shield has good documentation, numerous libraries, and it is easy and safe to use because it stops automatically if there is excess current flowing. However it endures relatively low current (1.2A) compared to other stepper motor drivers and doesn't work with stepper motors with rated voltage under 3V. Our team used a 12V 0.64A stepper motor with 15 ohms phase resistor. So, we were able to use the motor shield as the stepper motor driver. The raspberry-pi retrieves the weather forecast and shows it on the display. It works as a master of the entire system that controls the arduino according to the weather forecast and user inputs. The arduino controls the stepper motor and 4 IR sensors. The arduino motor shield is connected on top of the arduino to control the stepper motor. 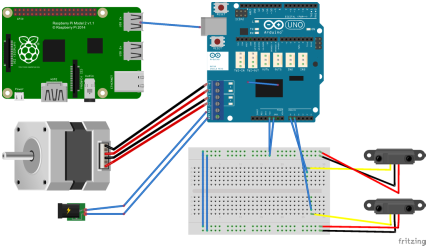 The IR sensors are connected to analog pins of the arduino, returning distance sensor values to check whether certain items are taken or not. Finally the arduino is controlled by the raspberry pi, functioning based on the weather information provided by the raspberry pi. The temperature sensor we used is the DS18B20 "1-wire" sensor. Through Raspberry Pi cobbler, we were able to read temperature data directly on Raspberry Pi. To do this, we have followed the documentation set by Adafruit. The circuit is illustrated on right. Learn more about the other systems!